Recently I realized that I desperately need to get my recipes organized into a binder of some sort. It's an overwhelming project that has been in the back of my mind since two Christmases ago when my friend received her recipes all organized and pretty as a gift from her sister. Super cool, right? But lately, I've realized that my system of 5000 sizes of mismatched papers/recipes in a big stack that I need to sort through each time I'm looking for a particular recipe (or even crazier, attempting to menu plan) just ain't working out! 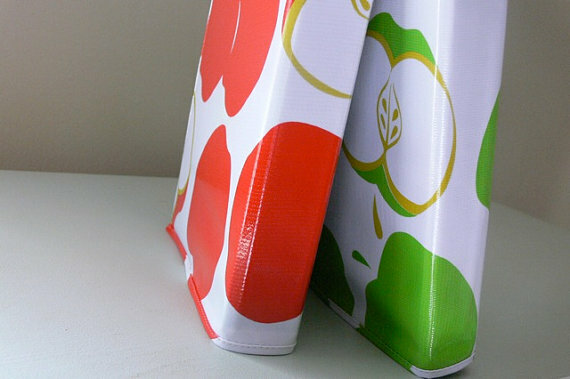 Obviously it will need to be easy to clean like these oilcloth covered binders or a plastic-covered binder with a cute patterned cover insert. It's the organization inside of the binder that scares me though...and I am the queen of organizing things darn it! 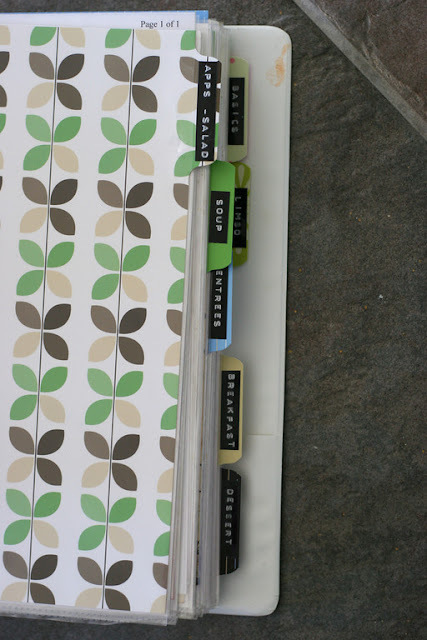 I love the look of these tabs (I mean who doesn't love Dymotape labels?) and creating categories and picking the recipes to go behind each tab...yeah, that actually sounds kind of fun to me. Here's what scares me...typing in every single recipe. It scares me as much as it scares Matt to have to do a series of basic math problems without being able to create some macro to do it for him. We're talking tedious and mind-numbing stuff. At the very least, I need a basic template so that I don't have to worry about the formatting and can just enter the recipes quickly. Can anyone recommend something I could use? Please! Because without it, I may never finish (or start) this little project. Please share any tidbits of advice you get! I've had this same project on my mind for YEARS. Seriously, years! Every time I want to work on it I, too, am overwhelmed by the amount of work that lies ahead of me. Going through piles of yummy recipes I want to try each time I want to cook something new is getting OLD. And yet I continue to pull recipes out of magazines. Apparently I'm a glutton for punishment. Wow... I was JUST thinking I really needed to give myself this gift, too! I have started this project a couple of times and the typing/formatting part is what gets me every single time... so I ditch it and go back to just printing and stuffing into folders, e-mailing myself, or scratching on paper scraps. Terrible!! i never realized it was that bad for you! having to do repetitive math is a form of torture for me when i know there is a much quicker way of doing it. glad you found a system to make it easier. and if it means lots of delicious dinners previously buried, even more the better! You COULD use the allrecipes.com recipe box. 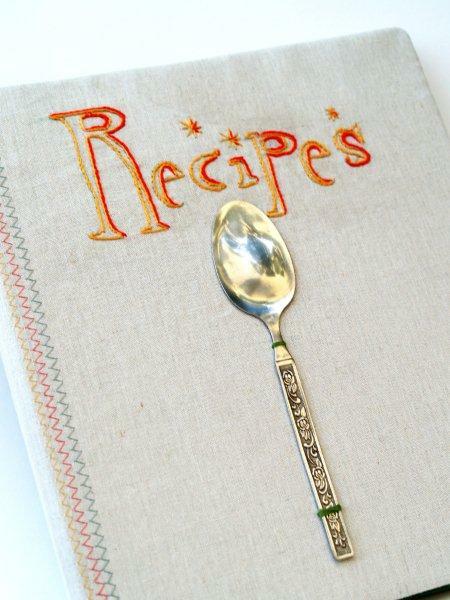 Enter all your recipes as private and then print them out via their site. They offer several page sizes...you would just have to know what size you were going to use before you buy your book, since there are only x amount of options. You don't have to share your recipes with anyone else, but just use it as a storage device. Even lets you categorize them. If it makes you feel any better...my nice organized binder has gotten OUT OF CONTROL!!!!! I have stacks upon stacks of paper that need to go in. One thing..if you do print them off the internet or have them on a nice piece, just insert into a page protector. All mine are in page protectors...only the ones on scrappy paper were re-typed. I actually like it so they are not all the same, they are easier to recognize even though they are categorized! I do like Sandy's idea though... may have to look into that one!!! and by the way...that was the best gift ever!!! as I have already told my awesome sister that I have lots more for her :) she did include another binder though, just in case! I just bought a couple of photo albums that have 4x6 openings in them. I just cut the recipes I had to fit the 4x6 spot or some I folded to make them fit. I also got some manila-looking folders that have a 3-ring holes and pockets to put the ones that are on nicely printed cards or take up a whole page that you don't want to cut/fold. Then I organized them into beverages, dips, soups/salads/sandwiches, side dishes, main dishes, breads/muffins, breakfast dishes, and I have a whole photo album dedicated to desserts. I have a sweet tooth. :) I can't imagine the task of trying to type them all in, and a lot of times you remember a recipe by what it looks like on the paper. And now I usually have the option when I'm printing out a recipe from the Internet to print out as 4x6 cards. Just an idea. 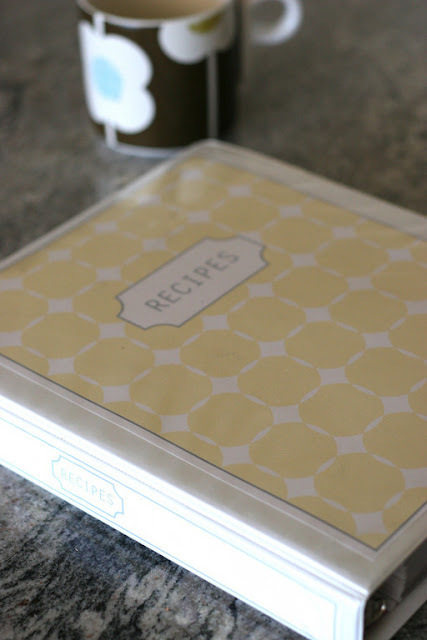 I actually really like my recipe box. The most used recipes always end up toward the front of the section, but that just means it's fun to go digging when you want something new/different.